● Started third, finished sixth and earned five bonus points. ● The Smithfield Farmer John Ford Mustang made its way to the front of the pack on lap three and led for seven laps. ● On lap 30 Almirola pitted for four fresh tires, fuel and adjustments to correct loose-handling conditions. ● He exited pit road in third and held that position until a lap-55 caution. ● The green flag waved with just one lap to go, and Almirola avoided a spin by the No. 17 car to finish just outside the top-five. ● He pitted the Smithfield Farmer John Ford at the end of the stage for four more tires, fuel and adjustments. ● Started third, finished fifth and earned six bonus points. ● Almirola started Stage 2 racing as high as second. He pitted under green on lap 90 for four tires, fuel and adjustments to match the balance of the car at the beginning of the race, but he said the No. 10 needed more rear grip. ● He exited pit road in seventh and raced back to the top-five by lap 111. ● Almirola pitted the No. 10 Ford Mustang for four fresh tires, fuel and adjustments at the conclusion of Stage 2. ● Started sixth and finished ninth. ● Almirola was caught in the middle of a three-wide pack with no help and was demoted to 10th at the start of the final stage. ● He raced back to sixth and pitted under green again for four tires, fuel and chassis adjustments. ● A caution was called just four laps later causing the Smithfield Farmer John Ford team to restart ninth. ● Almirola battled in and around the top-10 for the remainder of the race and earned his first top-10 at Auto Club Speedway. 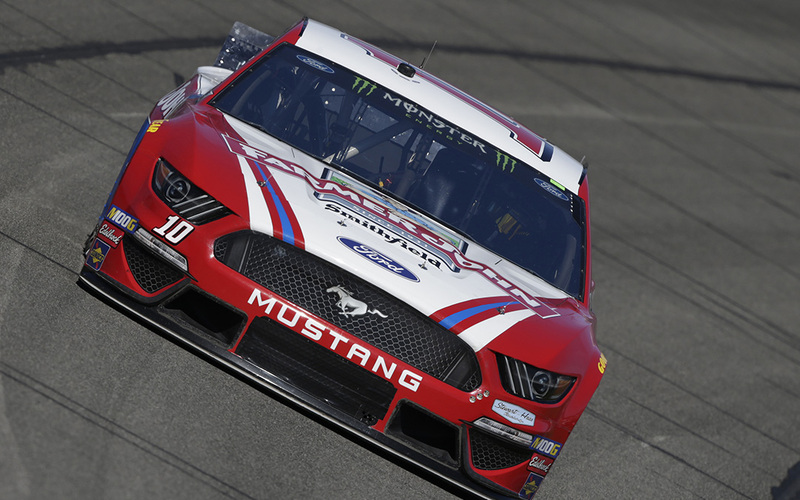 ● Almirola earned his fourth top-10 of the season and his first top-10 in 12 career Monster Energy NASCAR Cup Series starts at Auto Club Speedway. ● Almirola’s ninth-place result bettered his previous best finish at Auto Club Speedway – 11th in the 2015 Auto Club 400. ● Almirola finished sixth in Stage 1 to earn five bonus points and fifth in Stage 2 to earn an additional six bonus points. ● Almirola led one time for seven laps – his first laps led at Auto Club Speedway. ● Kyle Busch won the Auto Club 400 to score his 53rd career Monster Energy NASCAR Cup Series victory, his second of the season and his fourth at Auto Club Speedway. His margin of victory over second-place Joey Logan was 2.354 seconds. ● There were four caution periods for a total of 22 laps. ● Only 21 of the 38 drivers in the Auto Club 400 finished on the lead lap. ● Busch leaves Auto Club Speedway as the championship leader with a 15-point advantage over second-place Joey Logano. The next event on the Monster Energy NASCAR Cup Series schedule is the Martinsville 500 on Sunday, March 24 at Martinsville (Va.) Speedway. The race starts at 2 p.m. EDT with live coverage provided by FS1.